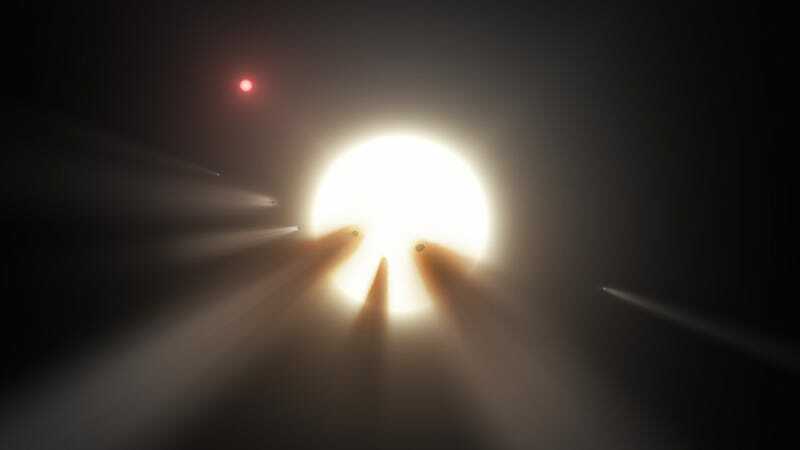 An oddly dimming star located 1,500 light-years from Earth is causing all sorts of commotion in the scientific community, leading some to speculate that it may be some sort of alien megastructure. A new analysis of infrared data suggests a more natural explanation. To quickly recap, star KIC 8462852, also known as “Tabby’s Star,” is exhibiting unprecedented flickering behavior. Normally, astronomers observe dips in brightness when a planet temporarily passes in front of a star. This dimming tends to be slight (just a few percentage points, even for gas giants like Jupiter) and periodic (which is suggestive of a planet in a stable orbit). But Tabby’s Star is different. Very different. At times, its brightness drops by a whopping 22%! What’s more, its brightness changes irregularly, sometimes for days—sometimes for months. Scientists have never observed anything quite like this, leading to all sorts of wild speculation. For instance, the aperiodic dimming could be the product of a catastrophic collision in the star’s asteroid belt, or the result of a giant impact that disrupted a nearby planet. Alternately, it might just be a dusty cloud of rock and debris. There’s even the possibility that it’s a distorted star. And as Penn State astronomer Jason Wright and colleagues speculated, it might be an alien megastructure, like a Dyson sphere, though as Oxford’s Anders Sandberg points out, that’s bloody unlikely. Marengo said the study looked at two different infrared wavelengths: the shorter was consistent with a typical star and the longer showed some infrared emissions, but not enough to reach a detection threshold. The astronomers concluded there were no excess infrared emissions and therefore no sign of an asteroid belt collision, a giant impact on a planet or a dusty cloud of rock and debris. It’s possible that a family of comets is traveling on a very long, eccentric orbit around the star. At the head of the pack would be a very large comet, which would have blocked the star’s light in 2011, as noted by Kepler. Later, in 2013, the rest of the comet family, a band of varied fragments lagging behind, would have passed in front of the star and again blocked its light. We didn’t look for that. We can’t really say it is, or is not. But what the star is doing is very strange. It’s interesting when you have phenomena like that – typically it means there’s some new physical explanation or a new concept to be discovered. The comet explanation would be striking if confirmed because we have no other instances of transiting events like these, and we would have found these comets by just happening to see them at the right time in their presumably long and eccentric orbit around the star. So despite PR headlines like Strange Star Likely Swarmed by Comets, I think we have to take a more cautious view. We’re dealing with a curious star whose changes in flux we don’t yet understand, and we have candidate theories to explain them. We’re no more ready to declare comets the cause of KIC 8462’s anomalies than we are to confirm alien megastructures. At this point we should leave both natural and artificial causes in the mix and recognize how long it’s going to take to work out a viable solution through careful, unbiased analysis. Sounds like this mystery isn’t going away anytime soon.